More than a handful of brands publish more content now than a major media property such as Time Magazine did 25 years ago. 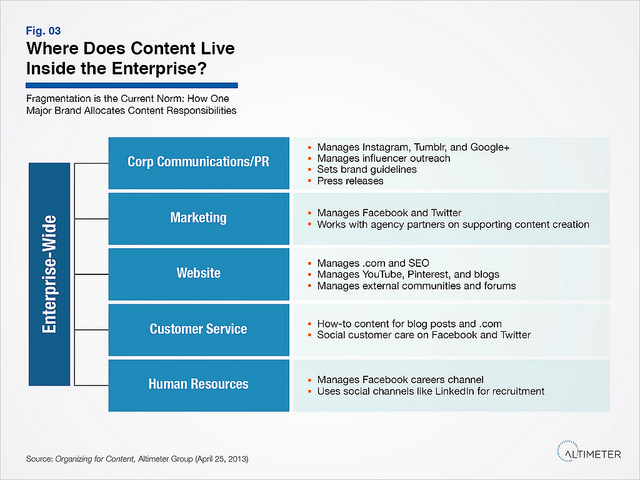 Despite the overwhelming and ever-increasing trend toward content marketing, and the need to continually feed an ever-increasing portfolio of content channels and formats, most organizations haven’t yet addressed content on either a strategic or tactical level. It’s high time they did, and hopefully my new research report, Organizing for Content, will help. It provides both frameworks for coping with enterprise content marketing demands and a checklist of recommendations for organizational readiness. Consider: The average organization is responsible for the continual content demands of an average 178 social media properties, to say nothing of a myriad of other owned media properties, from websites and blogs to live events. Those few large enterprises not yet active in social media can easily serve five million email subscribers, as well as multiple millions of monthly unique visitors per month to their sites. Who, or what, governs content internally? Responsibilities and oversight tend to be reactive, highly fragmented and distressingly ad hoc, as illustrated below. This highly typical diagram portrays how one major retail brand divides content responsibilities between divisions that are not necessarily interconnected or in regular communication with one another. This fragmented approach leads to inconsistent messaging, huge variations in voice, tone, and brand, and an uneven customer experience. Channel divisions themselves tend to be ad hoc, assigned more on the basis of hand-raising than any overarching strategic mandate. It’s high time that organizations got organized for content. It’s only going to become more demanding – and harder – in the future. Native advertising, advertorial, paid influencer, and sponsored content are just a few examples of the paid/owned media hybrids brands are exploring. Content must also be created for an ever-expanding spectrum of media, screens, and devices, ranging from smartphones and tablets to emerging platforms, such as augmented reality, Google Glass, and quite possibly devices like smart watches. These new channels and platforms, coupled with a trend that de-emphasizes the written word in favor of visual and audio-visual content, create new skill demands. “Hire a journalist,” a tactic many organizations adopted with the rise of blogging, now is in no way sufficient to address more technical requirements involving deeper knowledge of technology, production, design, and user experience. Requiring overtaxed and untrained staff to “do content” in their spare time is obviously hardly a solution. Our research identifies six organizational models companies are using to address complex, cross-departmental content needs, and also contains a recommendations checklist for content preparedness. Please download the report (at no cost, we just ask that you share it if you like it), and let me know your reactions in the comments. I’ll also deliver my findings in a webinar on Wed., May 29 at 1:00 EST. Please register and join us!